‘Free trade’ strategies have increasingly become a problem for the international labour movement. While trade unions in the North especially in manufacturing have supported free trade agreements to secure export markets for their companies, trade unions in the Global South oppose these agreements, since they often imply deindustrialisation. Especially the expansion of the free trade agenda into services, public procurement, investment, intellectual property rights as well as investor to state dispute settlement provisions are considered to be problematic. 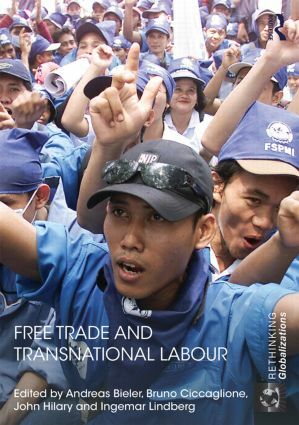 The purpose of this volume is to understand better these dynamics underlying ‘free trade’ policy-making in order to explore possibilities for transnational labour solidarity. Bringing together labour academics with trade union researchers and social movement activists, this volume moves from conceptual reflections about the impact of ‘free trade’ via the analysis of struggles around free trade agreements to considerations of concrete alternatives. 1. Trade Unions, ‘Free Trade’, and the Problem of Transnational Solidarity: An Introduction Part I: Conceptual considerations 2. Imperialist Rent and the Challenges for the Radical Left 3. ‘Imperialist Rent’ in Practice and Theory 4. Uneven and Combined Development and Unequal Exchange: The Second Wind of Neoliberal ‘Free Trade’? Part II: Empirical discussions 5. European Trade Unions and Free Trade: Between International Solidarity and Perceived Self-Interest 6. Canadian and European Unions and the Canada—EU CETA Negotiations 7. Trade Liberalization and Organized Labour in the Asia-Pacific Region: Barriers to Labour Internationalism 8. The Free Trade Area of the Americas in the Long Crisis of Brazilian Labour 9. The Congress of South African Trade Unions and Free Trade: Obstacles to Transnational Solidarity 10. Examining the Disconnect Between Mass Mobilizations and International Trade Union/NGO Networks in Struggles over Bilateral Free Trade and Investment Agreements Part III: Outlooks 11. Free Trade and the New Labour Internationalism 12. Unions and Trade: What Kind of Solidarity? 13. Global Crises: The Need to Go Beyond Transnational Solidarity in the Struggle Against the Expansion of Free Trade Agreements 14. Conclusion: Towards Transnational Solidarity on ‘Free Trade’ Policy? Andreas Bieler is Professor of Political Economy at the University of Nottingham, UK. Bruno Ciccaglione is an Economist and Trade Activist. John Hilary is Executive Director of War on Want, UK. Ingemar Lindberg is a former Union Researcher with LO, Sweden.